The Place People who work around CBD will be familiar with SPRMRKT, a home grown cafe and restaurant brand which has been opened since 2012 along McCallum Street. We only found out recently that they have a sister outlet in Robertson Quay called SPRMRKT Kitchen & Bar (STPI), along the scenic riverside in the hip estate. It is easy to miss the restaurant, as there are no visible signs for passersby. On level one, there is the SPRMRKT Daily grocery concept which carries several local brands and interesting produce like chocolates from neighbouring Malaysia. Beyond this grocery, take either the stairs or elevator to level two where you will be greeted with a gorgeous space. Nice natural light in the day, pastel shades for the chairs and a very comfortable ambience to dine in. The Food In comparison to its predecessor at McCallum Street, the less than a year old SPRMRKT Kitchen & Bar focuses on European bistro-style menu specially curated by the group’s Executive Chef-Owner Joseph Yeo, who previously held stints in Les Amis and Waku Ghin. We started with the Firefly Squid (S$24), a Japanese squid being torched and marinated overnight in soya sauce, sake, mirin and brown sugar. The texture of the squid was soft, with a nice chewy texture served with smoked cauliflower purée. For a taste of the ocean, the Fjord Trout (S$19) is a light option to share. The Norwegian trout was cooked mi cuit syle, simply seasoned with salt and served chilled. For mains, we tried the Malbec Oxtail Pasta (S$32), prepared from homemade pappardelle. I really enjoyed the oxtail bit, braised for several hours in an oven, with its flavours accentuated by the almost full flavoured Malbec. The al dente pasta is also topped with smoked Scarmoza cheese, an Italian semi-soft pasteurissed cow’s milk cheese. If you are a fan of Mac & Cheese, go for the Smoked Lobster Tail (S$42). The fresh Maine Lobster here is first cold smoked, then seared and topped with garlic panko crumbs. The cheese element was just right, as it didn’t give me the cloying feeling. Prepared with three types of cheeses including mozzarella, aged parmesan and emmental, pumpkin was also added to the cheese sauce to tone down the cheesiness, in a good way. For some meats, I was surprised by the Twice Cooked Chicken Roulade (S$28). For one, the chicken thigh meat was very tender, after being brined overnight before it was sous vide for a few hours. The second surprise was curry flavour on the dish, which came from the smoked curried cauliflower purée. The tinge of spiciness and aromatic from the curry definitely add to the enjoyment of this dish for me, am still a Singaporean at heart. 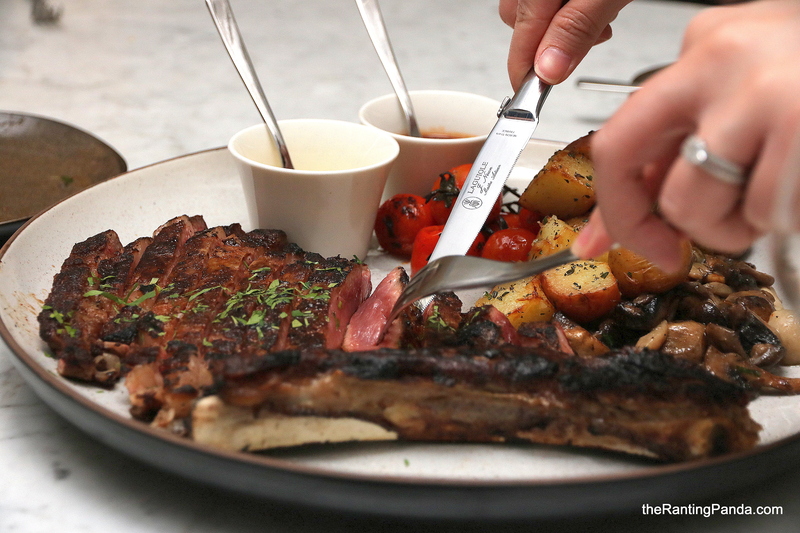 If you have a larger party, the Stockyard Côte de Boeuf (S$94) is a worthy option to splurge on. The succulent Australian beef is about 600g and grain-fed for 200 days served along with mixed mushrooms and bearnaise sauce. For desserts, go for the Earl Grey Creme Brûlée (S$16) if you can only pick one. The earl grey was rich enough for me, and I enjoyed the lemon lavender streusel base as well. The overall flavour wasn’t too heavy, quite an ideal choice to end off the heavy meal. If intensity is your game, then the Three Beet Chocolate Lava Cake (S$18) will not disappoint. The lava cake did explode with a nice warm ooze, with its rich 70% Valrhona dark chocolate. The beetroot, raspberry sorbet and yoghurt cream elements managed to balance the overall flavour of this dessert well. In essence, you get the best of all worlds. Kudos to the beautiful plating as well. Rants It would really do SPRMRKT Kitchen & Bar more justice if there are more prominent signs to the restaurant. During our return visit to the SPRMRKT Daily, service was not very consistent too. Will I Return Again? We enjoyed the food, the complexity of the flavour and the space here at SPRMRKT Kitchen & Bar. It is not too packed for now, ideal for a casual romantic date night, and probably a leisure stroll along the riverside post dinner. Make your reservation instantly at SPRMRKT Kitchen & Bar here.